Orford Castle retains a near perfect 'Keep' which was once the heart of an important royal castle. 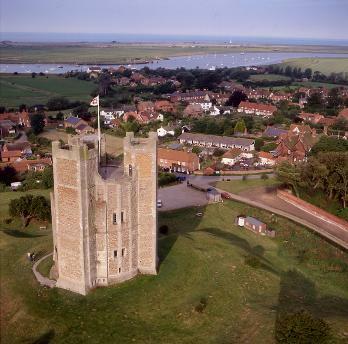 Orford castle was built between 1166 and 1172 by Henry II as part of his coastal defence in order to stop Hugh Bigod, Earl of Norfolk who attempted an attack on his authority. £1413 was the total cost to King Henry II to complete the castle. The town of Orford was developed and the port was improved by draining the surrounding marshes. It was a successful attempt by Henry II to re-establish royal power in East Anglia. It was also part of a network of coastal defences. Orford was at that time a busy port. It was the first castle in England to have a series of mural towers projecting from the curtain walls. The walls of the uniquely shaped Keep are 10 feet deep, and conceal a maze of well-preserved rooms and passages. There were three 90 foot buttress towers, a curtain wall, a gatehouse, flanking towers, and the grounds were surrounded by a large ditch. The splendid spiral staircase which rises sheer from the basement to the top of the Keep, gives access to magnificent views seaward over Orfordness and the River Alde. The keep was also unusual being polygonal with the addition of three rectangular towers and a forebuilding. It was a forerunner of the cylindrical keeps of the 13th century. This was an innovation of great military importance in the later part of the 12th century as it allowed the garrison command a field of fire without exposure to the enemy. Following the death of King John it was taken by the French contender to the crown, Prince Louis. In the reign of Henry III the castle changed hands frequently during the baronial wars. 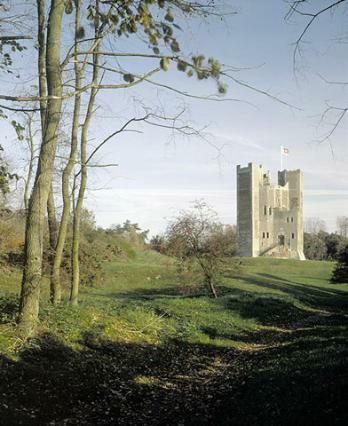 The castle was then maintained by the Crown but in 1336 Edward III granted it in perpetuity to Robert de Ufford who, a year later became Earl of Suffolk. The chapel at Orford castle is the most well preserved stone altar in Suffolk. 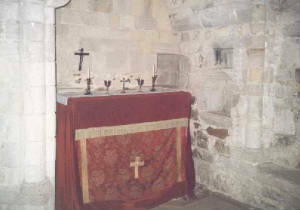 The chapel was used for over 500 years for church services.